Veligandu Island is surrounded by a lagoon and a private house reef. It’s the tropical holiday that’s on many a bucket list – but does it live up to the dream, asks Tatyana Leonov? The seaplane twitches like a nervous sprinter at the blocks then jumps into the air. We’re almost there. Everyone’s dreamed about this holiday – the one where you stay in a gorgeous bungalow above a ridiculously turquoise sea. It’s a bucket list item many hope they will one day check off and I am no different. It’s the type of indulgent holiday you don’t book on a whim though; it’s definitely one to keep for those special occasions. Lucky for us it’s our honeymoon and this is a honeymoon script hard to beat. The Maldives consists of about 1190 islands scattered into coral atolls and just over 100 of those islands are resorts – so picking one is not easy. There are island’s with underwater restaurants, flagship spas and swanky nightclubs; resorts that house bungalows only accessible by boat (for the ultimate private getaway); and pools that stretch to ‘infinity and beyond’. Bucket list view? Veligandu Island Resort. If you’ve got the money you’ll find almost anything you want in the Maldives. We book Veligandu Island Resort based on the price and reviews. It seems to be the resort that has everything we need – for a moderately lower price compared to other resorts that seemingly offer much the same thing. The seaplane glides effortlessly across turquoise blue water to rest at the atoll’s jetty. Men in white flowing shirts greet us with colourful drinks, luggage is whisked away, shoes vanish – welcome to Veligandu. Eighty-one villas are scattered along the coastline of the 600 metre-long, 150 metre-wide idyllic island (which holds a mix of over-water and beach villas). Our over-water villa is almost the best. The best is the villa on the end of the walkway, with sunset views and infinite shades of that crystal clear water. We are second from the tip of the walkway so I’m not complaining. Guests in over-water villas can dip-in and out as they please. Although the over-water villas feel quite close together, noise levels are minimal throughout our stay (though that could just be because the island is full of couples keeping to themselves). The villa interior is neat and functional. In-room beverages are courtesy of a Nespresso coffee machine, an overstocked tea box and a fridge filled with wine and beer (replenished daily if you book an all-inclusive package). The bathroom leads to the villa’s own outdoor jacuzzi, while floor-to-ceiling bi-fold doors open the bedroom/living area to the deck. This is the place to be. The simple and spacious interior of the jacuzzi water villa. All up the villa is 86 metres-squared including the outdoor jacuzzi and deck – large enough to not feel cramped. With three buffet meals a day, there’s a danger of menu fatigue. As buffets go, it’s probably one of the best. Breakfasts include the usual – plenty of fresh fruits, muesli, cereals, yoghurts, a hot selection, and an egg and waffle station. For dinner, the cooked-to-order stations offer a semblance of à la carte dining. We choose from grilled jackfish, creamy seafood risotto, tender wagyu beef, barbecued veggie kebabs and buttery pesto gnocchi. Dine in the open air with sand between your toes. Dessert is disappointing. The colourful dessert bar looks lucrative each and every time – but looks were deceiving. Cheesecakes, puddings and mousses all appeared as if they would knock your taste buds out with a blissful infusion of sweet flavours, but they all taste the same, just sugary. What dessert we do eat we snorkel off. The crystal clear house lagoon is a delight to explore amongst the colourful schools of reef fish, sharks and manta rays. We quickly develop a structure to our day – mornings are for snorkelling and laying on the beach, and afternoons for relaxing on our deck with the occasional snorkel thrown in. There are plenty of activities for those that need stimulation; two tennis courts or an indoor air-conditioned games room with a pool table and table tennis. You can play board games at the bar (not as boring as it sounds – I taught my husband how to play chess over a few cocktails), and there’s a decent-sized DVD and book library at reception. And, of course, I indulge in a massage. The treatment is as it should be – relaxing and tranquil. Water activities include cruises (book in the day before), windsurfing, catamaran sailing, kayaks, surf biking, scuba diving and, of course, snorkelling. We do a night snorkel, which is wonderful. Our waterproof torches and clued-up guide open our eyes to a more active evening reef. Even without a snorkel, we have an excellent view of the underwater world at night through the pristine water. As we walk home after dinner, we see manta rays and stingrays peacefully gliding under the boardwalk. The selling point of the resort is the location (evidently), the daily feasts and the courteous staff who are there when you need them but remain largely unseen throughout your stay. When choosing just one resort the level of luxury in the Maldives is simply mind-boggling, but if you’re after days filled with sun, swimming, snorkelling, massage and food – you’ll be happy whiling away your time at Veligandu. 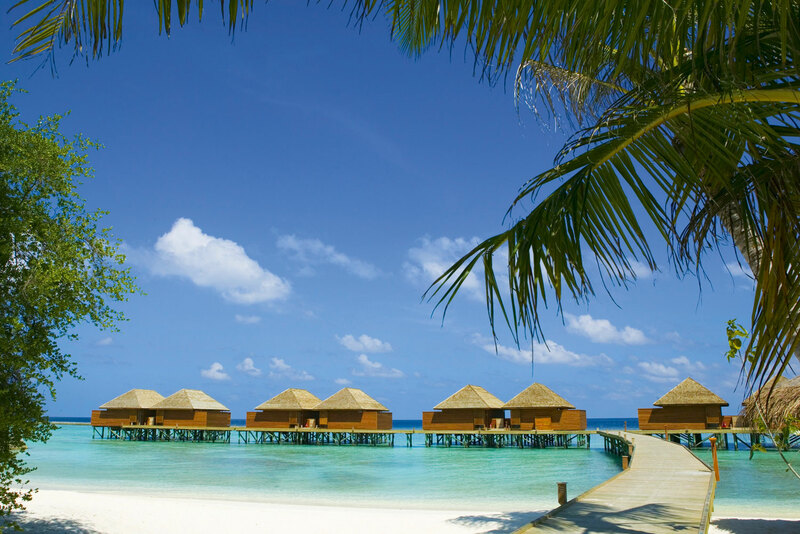 Veligandu Island Resort & Spa: Island of Veligandu North Ari Atoll, Maldives. The IT Verdict: Jetlag disintegrates swiftly and days quickly become dream-like at Veligandu. For us, Veligandu was the pinnacle of island escapes. The underwater spa at Huvafen Fushi is as special as they get (and it’s the first underwater spa in the world); close your eyes and escape into a world of relaxation; open them and see fish swimming a mere few metres away. Stay above water – with 44 modern bungalows to choose from. 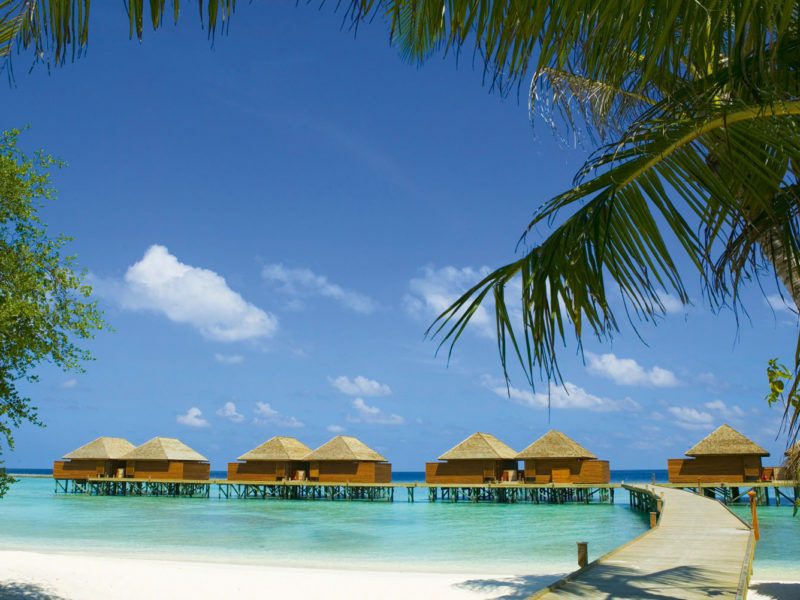 Environmentalists will be keen on Six Senses Laamu, the only resort in the Laamu Atoll. Recycled and sustainable materials have been used for everything – from the impressive villas to the weathered timber jetty. Some of the villas feature treetop panoramic decks for the ultimate Maldivian sunset. This is a great resort for love-struck couples or families seeking a bit of seclusion. There is an array of activities from diving in the underwater world (the resort is close to a number of fantastic lagoons for great scuba diving) to sampling a diverse range of cuisine. The accommodation ranges from superior rooms to over-water bungalows. Could this be the most chill place on Earth?